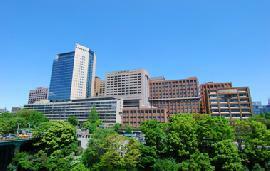 The Tokyo Medical and Dental University (TMDU) can be traced back to the Tokyo National School of Dentistry, founded in 1928, and today incorporates the TMDU Hospital of Medicine, the TMDU Dental Hospital, and the TMDU School for Dental Technicians. 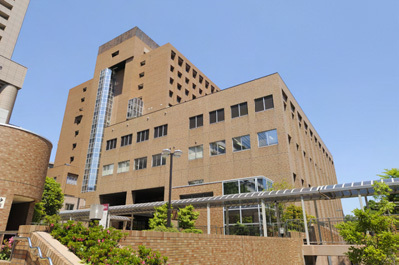 It is the only multi-disciplinary university for medicine and dentistry in Japan; for dentistry, in particular, it is the oldest national university in the country, and the TMDU Hospital Faculty of Dentistry sees around 1,800 outpatients a day. The TMDU Hospital of Medicine, which comprises 31 clinics and 15 central clinical divisions, has been organized in order to provide optimal care in all medical fields. The hospital carries out the diagnosis and treatment of intractable diseases, including cancer, neurological diseases, cardiovascular disease, autoimmune disease, allergic and genetic diseases, and lifestyle-related diseases. It is also active in the research and development of new treatments. Innovative treatments carried out at the hospital include the treatment of intractable and serious infections through activated lymphocyte infusion, the treatment of cancer, the treatment of peripheral circulatory disturbances (e.g. thromboangiitis obliterans) through peripheral blood stem cell transplantation, bone marrow cell implantation, endoscopic surgery on neoplasms in various organs, arthroscopic surgery, off-pump minimally invasive surgery for coronary arteriopathy, endovascular surgery for cerebrovascular diseases, and anti-cytokines therapy. The TMDU Dental Hospital provides a variety of services to meet patient needs, including outpatient services in sports dentistry, psychosomatic dentistry, speech therapy, dental allergies, dysphagia rehabilitation, special care, and fresh breath. The Hospital also runs specialist clinics, such as a pain clinic and temporomandibular joint clinic, which all use cutting-edge dental technology and treatment. At present, TMDU is conducting a number of large-scale research projects, including the Global COE Program “International Research Center for Molecular Science in Tooth and Bone Diseases ”, funded by Japan’s Ministry of Education, Culture, Sports, Science and Technology with the objective of becoming an international hub of education and research in this specialist field. TMDU is a world leader in research on the science of tooth and bone diseases, and conducts basic research to elucidate the mechanisms of disease in relation to the loss and formation of hard tissue and to promote basic research in diagnosis and treatment. 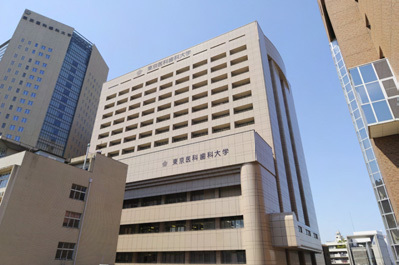 Elsewhere, TMDU is also involved in multiple training programs for healthcare professionals, including the Human Resource Development Plan for Cancer (part of the Ministry of Education, Culture, Sports, Science and Technology’s Cancer Professional Training Plan), which is designed to nurture medical professionals specializing in cancer medical care, from oncologists to paramedics. TMDU has strong relationships with leading overseas universities, running programs such as clinical training at Harvard Medical School and an exchange program with Imperial College London. These international partnerships and collaborations aid TMDU in fostering outstanding medical and dental professionals with world-leading potential in both the research and clinical fields. TMDU also incorporates two dedicated research institutes. The Institute of Biomaterials and Bioengineering has a record of strong success in the development of materials for regenerative medicine, new drug delivery systems using nanogels, and odor sensors that use bio-recognition devices; it is hoped these will soon be developed into clinical and applied research. The Medical Research Institute has thus far produced an impressive body of research results on such topics as the elucidation of the genes responsible for cardiomyopathy, the discovery of new autophagic mechanisms, and the explanation of the mechanisms of hair graying.